Hola. Veo que usas DANIEL SMITH y también GRAHAM… Yo uso Grumbacher o Windsor And Newton. Los colores cambian mucho entre las marcas, unos son más brillantes y otros muy opacos. Uso Grumbacher para mis acuarelas y también pinto con esa misma marca algunos trabajos en Gouache. Soy Diseñador Gráfico (Graphic Designer). Un abrazo y felicidades por tus trabajos y los de tus compañeros. Hace tiempo que los veo y siempre descubro algo nuevo con ustedes. Hasta pronto. My Spanish is good enough to understand what you say but not good enough to reply without grammatical errors so I hope you don’t mind my response in English. Thanks so much for writing. Yes, I also find that there are many differences between different brands of the same colour. If you learn how to read Handprint.com in detail, you’ll understand why. I think the best way is to try out different brands and find what works best for you. I always try to stick with Artists Quality paints, rather than student quality. Hi Shari. Do you know what brand your palette is, and/or its dimensions? I LOVE your posts and paintings and so appreciate your teaching blog. Hope you’re doing well! Now that I see the specs, turns out it’s for oils and acrylics but it works fine for me. I’m doing well. Hope you are too. Yes Linda…. I’ve been dreaming of asking for this for some time…. Now we can paint like Shari! ( yeah! good luck with that!) I’ll continue to enjoy her grace and ease and hope for the best. You are very kind TR. I’m glad you found it useful. I don’t know why finding out what colours other painters use is so fascinating but it is. 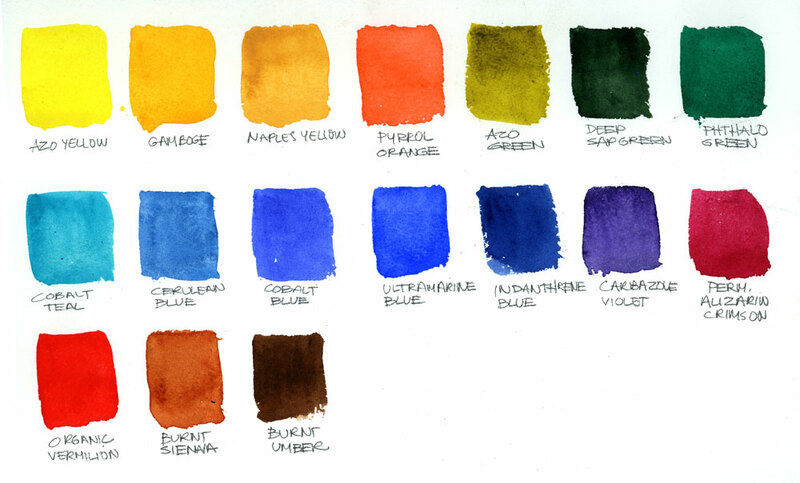 This first thing I do when I read a watercolour book is go to the page where they list their pigments. That helps me to understand their watercolours better. Absolutely wonderful. Thankyou so much, especially for your comments on each of the colours. Thankyou for the links. And yes I am one who is interested in the science of watercolours. I’ve had a quick look at handprint.com and I can see I am in for a lot of fascinating reading. Cheers. I’m glad you like handprint Sandi. If you are interested in that, it will take up hours of your time for sure. Thank you so much for sharing your talent and experiences, you have no idea how inspiring you are. I look forward to see what tomorrow brings. Big XO. like the ocean with it’s unfathomable depth, yet you managed to make it’s complexities digestable. For all your work , thought and logic in this key watercolor lesson – I thank you. George, I always want to quote what you write. “Colour itself is like the ocean with it’s unfathomable depth.” I may have to steal that. Thank you ! I love reading about color alongside seeing the artwork. I use Curry’s as well but now we have Daniel Smith at Omer de Serres in Montreal. I don’t know if you have that chain in Ottawa. They do have locations in Toronto. I too would love to know the name of that palette, and where to get it. As you will see, it is for acrylic and oil but it works fine for me, after roughening up the mixing surface with some Vim. Carbozole Violet… the secret color I’ve been trying to figure out! Thank you for sharing this Shari… the whole list… thank you so much! Thanks TR. Carbazole Violet is quite strong. Use cautiously. how generous of you, so interesting and well explained, not long at all. thank you for sharing. I am always blown away when viewing others palettes. I have many of the pigments you have and they are in my not-so-much group. I tend to like transparent pigments, tho I love Cobalt Teal. I notice that you use a lot of M. Graham. I love the paints but found that they don’t dry as well in my travel box. 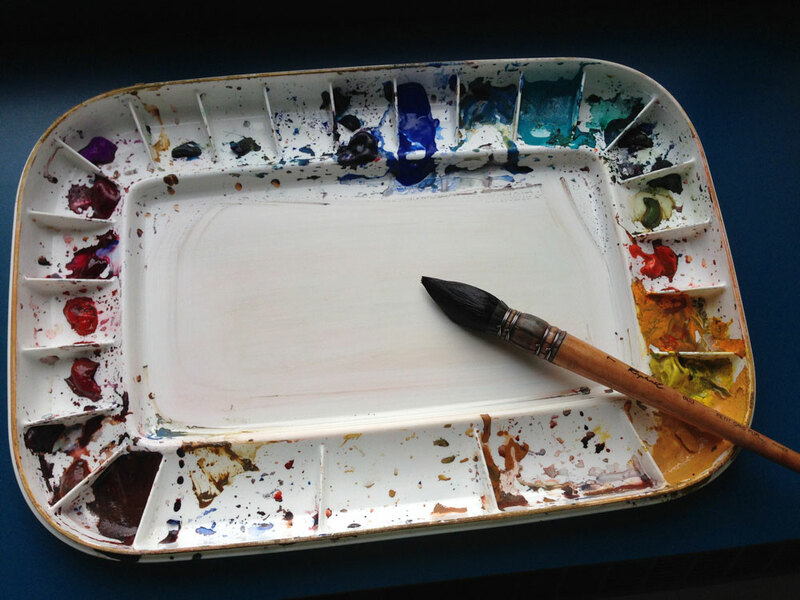 Are you using your pigments from the tube on a palette (like oils) or do you have pans that you put your paints into and carry? If you use M. Graham paints you need to let them dry for a few days before you go out. Or squeeze out a bit on site as I sometimes do. I use to squeeze out big blobs of paint that would go into freefall in the palette as I travel around but now I would rather use smaller amounts and refill more frequently. Thank you so much for sharing all this in great detail! I’m glad you found it useful Karina. Thanks for letting me know. This is really useful, Shari, I think I’m going to substitute out a yellow, an orange and a blue for ones you have. Love that you say why you use these and the reasons run the gamut from “too runny” to (my favorite) “warms up the horizon line beautifully”: how could I not be totally sold on that one? 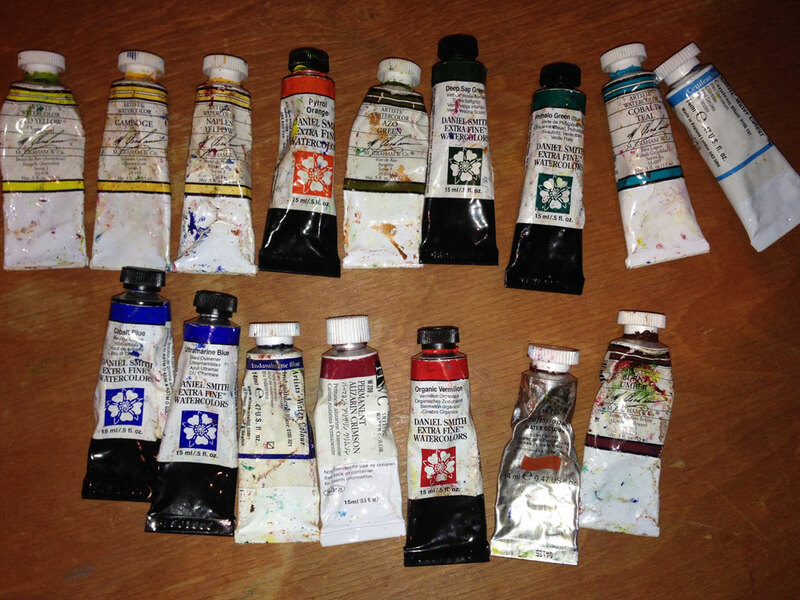 :0 Looking forward to the brushes post… and please do one on burnt sienna! Shari, I have just read your study on colour – thank you so much for sharing this study. I am still new at art and I need a guide on what colours can do. It makes it so much more fun! Notes on color–and the specificity–are so helpful. Cerulean has always been a favorite of mine and I’m sure I’ve bought a tube in every brand I’ve come across; Winsor Newton is the only one for me, too. Ditto, burnt sienna. Now I’m eager to try the DS organic vermillion. Thanks so much for your generosity in sharing your experience and expertise. Thanks so much for writing Barbara. English is not my language but I will try to make myself clear. 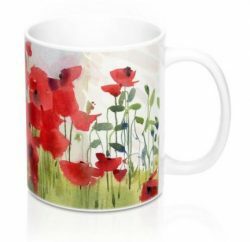 As I see you are a great artist and “acuarelista” (spanish for watercolorist), so let me ask you if you can help me or know somene who can help me with this issue. My father dies 6 years ago and left me his collection of brushes (among other things), and some of them are Arches A4 Petit Gris Pur in different sizes, but almost all of them carry a great amount of liquid but when you make pressure to them they can not return to it´s pointed shape, they stay bended, is this normal or they were stored too many years without any use. They have their plastic capsule so the hair was not squashed. I hope have been somewhat clear. Thank you for your time and keep the great work you do. It seems to me that your writing in English is excellent. My mother also left me many art supplies which I really appreciate. He left you some excellent brushes and they are probably fine. If you have a lot of water on the brushes and you put pressure on them they will stay bent. That is normal. But I think they are not meant for a lot of pressure so if you load them up with water and paint, then don’t press to hard. They paint beautifully. You can always put them back in their natural shape by hand. Don’t keep them in the plastic capsule after using them. They will disintegrate. Instead let me air dry. The capsule is only meant to keep them safe in the store and for transportation. These brushes are not that great for detail work but best for that big first wash. After that I usually switch to a finer brush with more “spring” like a sable brush. I hope that helps. Best of luck to you in your painting. Thank you Shari for your quick and detailed response, it was a great help. OH my…Shari, you are incredible, I just started doing watercolors in my retirement. I am a cartoonist and caricature artist, I have spent the last 45 years making a living at doing it at events and parties. I am now doing watercolors and found Milink Mulick and Dan Marshall and so many others. But now I found you…incredible. I was born in Longueuil PQ and moved to the U.S with my parents when I was 15. I did get excited when I saw your book all about Montreal. Can I ask why I get small pimples on my watercolor paper sometimes? I use 140 Fabriano. I would appreciate a reply. God bless you.